With numbers estimated at 75,000 to 100,000, Ontario has one of the largest black bear populations in North America. 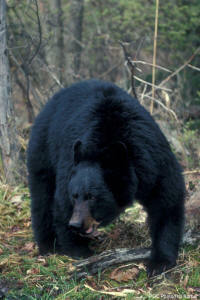 Black bears are distributed widely across northern and central Ontario, with a range that extends into southern Ontario’s lush Great Lakes-St. Lawrence forest region. Bear hunting seasons in the north run from mid-August into October. A September opening and November closing in effect in more southern WMUs. In all units with a bear season, hunting is open to both residents and non-residents. A season exclusively for bow and muzzleloader hunters is offered on the Aulneau Peninsula in northwestern Ontario. During the time of the hunt, bears are eating to accumulate body fat necessary to carry them through winter. In northern Ontario, berries are a large component of their diet, while in the deciduous forests to the south, beechnuts and acorns are additional dietary staples. Baiting can be a particularly successful hunting method, with the hunter in a tree stand or in a ground blind. Baiting is often used early in the season when leaf cover can limit the effectiveness of stalking. Spotting and stalking bears is possible in more open areas with the right combinations of rock ridges, old burns and mast crops. Late fall, when deciduous trees and shrubs have dropped their leaves, is a prime stalking time. In central Ontario, bear hunting with dogs is popular with some hunters who use human contact. Nonetheless, as one of the largest predators in Ontario, they deserve tremendous respect in contact situations. To discourage unwanted attention by bears, wise hunters ensure that their camp is clean and secure. Hunting bears near garbage dumps is prohibited. Ontario bears are most commonly taken by high-powered rifle, but shotguns loaded with slugs can be effective from the short ranges offered by tree stands or ground blinds. Shotguns must not be smaller than 20 gauge. Bow hunting for bear is growing in popularity, particularly over baits. When bow hunting, certain conditions apply to your longbow, recurve or compound. Draw weight must be 49 pounds (22 kg) or more when measured at a draw length of 28 inches (700 mm) or less. Crossbows must have a draw weight of 119 pounds (54 kg) or more and a draw length of 12 inches (300 mm) or more. Refer to the Ontario Hunting Regulations Summary for specifics on arrows and bolts. Black bears are tough, strong, large-boned animals. Only shots certain to kill should be attempted and only when using equipment with sufficient energy to do so cleanly. Most non-residents hunting bear in Ontario will be required to use the services of an operator (a tourist outfitter, guide, or air operator) licensed to provide black bear hunting services to non-residents. Check the Ontario Hunting Regulations Summary for details. A black bear hunting licence validation certificate (available from your hunt outfitter) is needed to validate a nonresident black bear hunting licence. Dogs used to hunt black bear must be licensed for this activity in Ontario. Like a moose, a black bear presents a challenge to get from the field to the camp, butcher, or cold storage. Proper preparation and equipment are essential. Hunting Camps and Lodges near North Bay, New Liskeard, Temagami, South River, Loring, Restoule, Callander, Field, Sturgeon Falls and River Valley. English River, Ignace, Pickle Lake, Savant Lake, Sioux Lookout, Dryden, Wabigoon, Eagle River, Red Lake, Ear Falls, Perrault Lake, Kenora, Minaki, Sioux Narrows, Nestor Falls, Fort Frances, Rainy River, Emo, Atikokan, and Quetico Park Hunting Lodges.